James Harden put the end of his historic scoring streak down to flat shooting and a slow start in the Houston Rockets' 110-101 defeat to the Portland Trail Blazers on Saturday. The Rockets guard had become the first NBA player to score 40 points or more in five consecutive games, but Portland held him to 38 points on 13-of-35 shooting. Mike D'Antoni suggested Harden could have some lingering emotions hanging on him from Thursday after their overtime win against the Golden State Warriors, but the 29-year-old felt he let his high standards slip early on. "My shots were flat in the beginning of the game," Harden said. So I just had to adjust a little bit, get them up. That was another thing, for myself I've got to get off to a better start. "I picked it up in the third quarter and the second half, but that first half I had the same opportunities I normally get but my shot was just a little flat." The Rockets went 5-0 during Harden's 40-point streak and had moved up from 14th in the Western Conference to fourth after winning 11 of their past 12 games. He joined elite company like Kobe Bryant, Michael Jordan and Allen Iverson as the only players to have a run like that in the past 50 years. "It's unbelievable now, you grade him on a sharp curve where if he gets 38, now if he doesn't get 40 it's like, 'well, what's wrong with you?'" D'Antoni said. "He's gone up another level and he'll stay up there. And that's why when people say, 'he can't continue on this tear,' yeah he can, because he's doing it with ease, as long as he stays healthy." 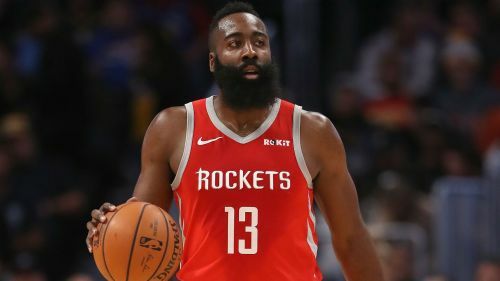 While Harden acknowledged his record run was impressive, he was ready to shift his focus back to winning as he looks ahead to Houston's game against the Denver Nuggets on Monday. "Honestly that streak is pretty cool for stats and whatnot, but honestly the win is more important," Harden said. "So, came up short [against the Blazers] and now we've got another opportunity to go home and play Denver, who's playing exceptionally well. So we've got to regroup."